Our visit to the Amana Colonies, in Iowa was a chance to slow down and enjoy a simpler pace. Like many of you, our lives can become so hectic with all of the commitments, that we almost forget how to relax. Our morning drive began with rush hour traffic, but before long we found ourselves cruising through the Iowa countryside. The sight of roadside vegetables stands and Amish buggies suggested us we had traveled, not only to another region, but also another time. While the people of Amana are not Amish, we were certainly in a region that offered a slower pace of life than what we are used to in the city. 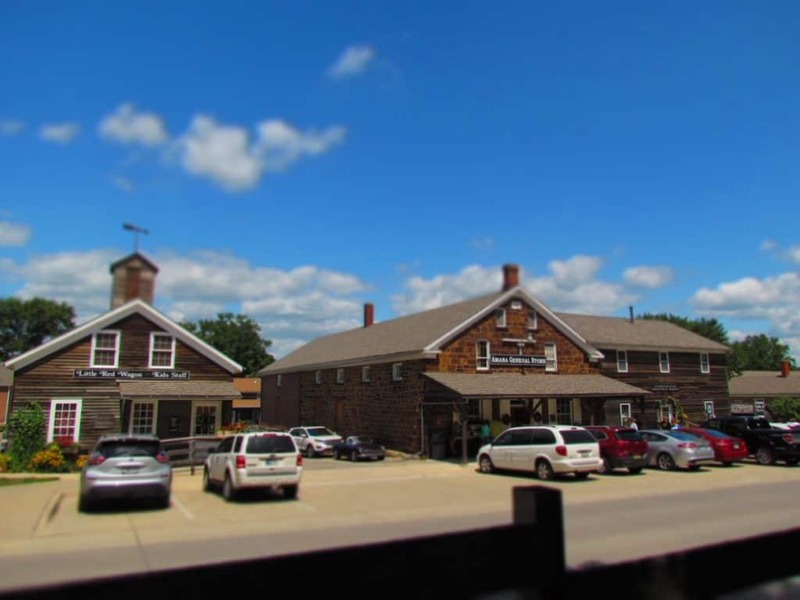 The Amana Colonies are comprised of seven villages, which form a chain of communities. The name Amana is a common theme with six having it in the title. West, East, Main, South, High, and Middle Amanas are joined by Homestead to complete the list. Our focus was in Main Amana, which is quite often just called Amana. It is the largest of the towns, and contains the majority of the shops and restaurants. A good way to begin a visit is a stop in the Amana Heritage Museum. Here we learned about the history of the community and the German Pietists who formed it. They came to America to pursue their religious freedom, and after a stay in New York, finally settled in the middle of Iowa. They kept to themselves with a self-sufficient society until the mid 1930’s. With a better understanding of the community’s background, it was time to explore it for ourselves. The Amana Colonies was added as a National Historic Landmark in 1965, and has become a major tourist attraction. Living a communal lifestyle meant that residents worked as a community to supply schooling, medical needs, meals, and all other necessities. No one received wages, but all had a living stipend to purchase their supplies. Jobs were assigned by the community leaders, and quality craftsmanship became synonymous with the name Amana. Their lives were simple, and unchanged for many years, but the Great Depression brought a change. A ruined marketplace was the catalyst for a change that allowed a greater interaction with the outside world. 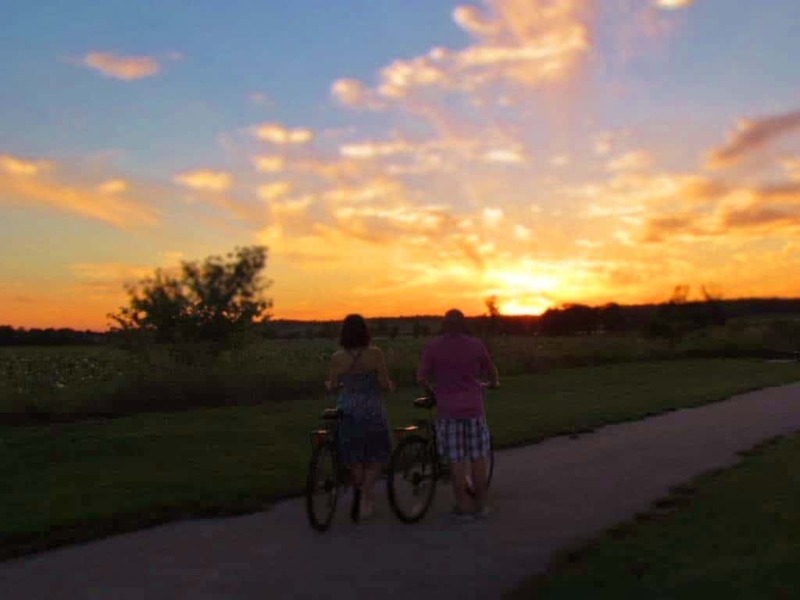 These days travelers from all over the world descend on the Amana Colonies to experience the hospitality and quaint nature of the area. During our drive through the villages, we came across a couple of interesting places, The first was the Whirlpool factory. We both had one of those “ah-ha” moments, when we realized the association of the name Amana, in reference to appliances. Yes, this is the home of the Amana Radar Range, for those of you old enough to remember. The second thing we discovered is called Lily Pond. This small lake is almost completely covered by lily plants. During the warm weather, the flowers open each day and create a beautiful landscape. It was certainly an amazing sight to behold. The Amana Colonies have a long history of food making. Being a self-sufficient community requires attention to details, and it certainly comes through in their food products. We started our morning with pastries purchased at one of the local bakeries. A suggestion from the Visitor’s Bureau staff had us waking early one morning to drive to the next town over. Here we found Hahn Babker (bakery) open for business. On Tuesday through Saturday, Hahn Bakery opens to sell all of the goods they have baked up that morning. Once they are gone, the store closes, so you will want to arrive early. At the Amana Meat Shop we were hard pressed to only purchase what would fit in the cooler we brought from home. We had called ahead a couple of weeks, and had them set back some dry ice to help protect our investment. After savoring all of our goods when we got home, it is safe to say that this is some of the best meats we have ever found. We are so glad that they offer mail order, so that we can enjoy more of their wonderful products when we choose. The Chocolate Haus is a little slice of heaven in the middle of the Colonies. This store is packed with all kinds of truffles, caramels, fudges, and just about anything that can be coated in chocolate. 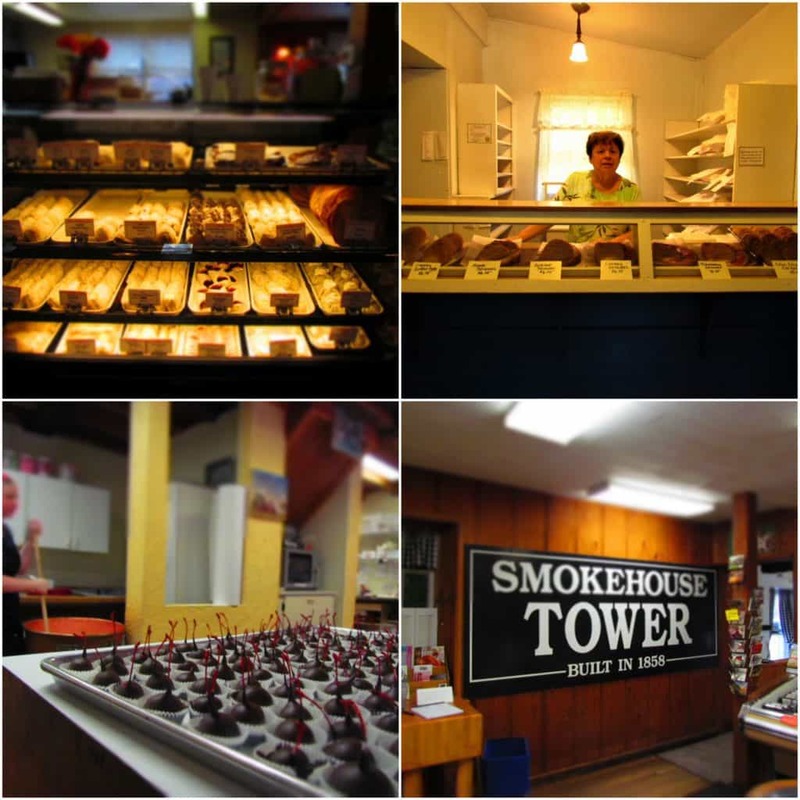 It is a working chocolate shop, and each time we visited they were in the process of making a different sweet treat. The aroma inside the store is intoxicating, and the treats are delicious. Our stay in Middle Amana allowed us four restaurant options, and we sampled them all. 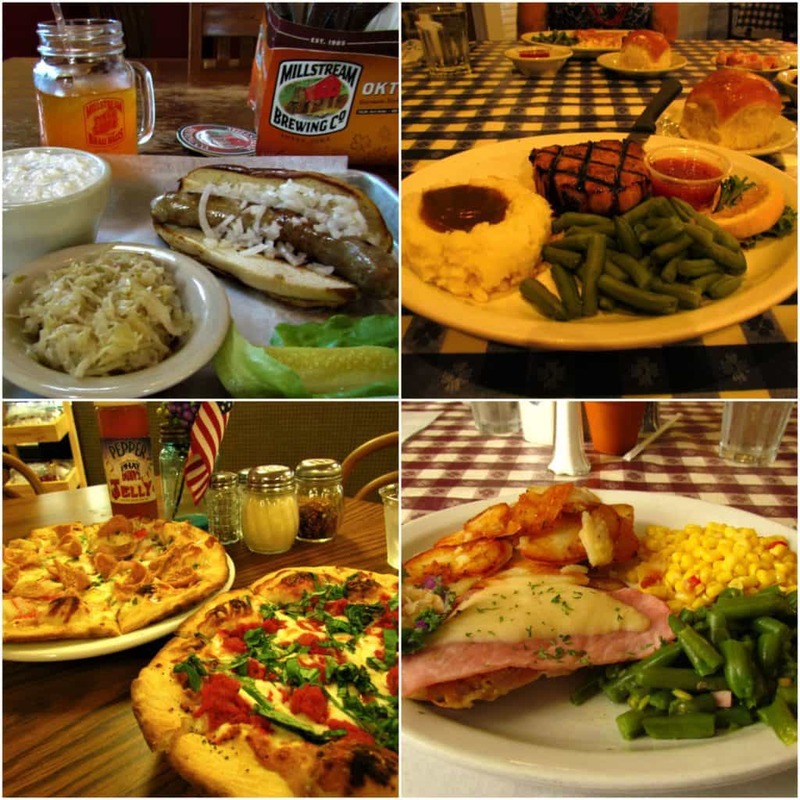 The Amana Colonies were founded with communal kitchens, which meant that everyone ate in large gatherings. Food is essential to life, and the residents embraced this time for bonding and fellowship. These same sort of values remain today, and some of the restaurants still offer “Family style” dining. At Millhouse Brau Haus we dined on German traditional foods created with a modern twist. This recently revamped inn has been turned into a quaint dining establishment that features beers from the oldest craft brewery in the state of Iowa. Everything was so good that it was difficult to stop eating when we got full. Our visit to the Ox Yoke Inn was filled with traditional standards. While we enjoyed the food at all of the restaurants we visited, the Pork Loin at this place was an amazing dish. We quickly discovered that the meats from the Amana Meat Shop were a common theme throughout the colonies. When you visit this restaurant, be sure to check out the small museum on the second floor. The Ronneburg Restaurant was big on the family style dining feature. This is the type where each guest picks a main entree, and then the sides are delivered in large multi-serving bowls. Since we were a party of two, we never had the chance to experience this style of service, but it was clearly a popular choice among others in the restaurant. It was clear that the German heritage of the colonies shines through in many areas, and especially in the dining menus. How surprised we were when we discovered PHAT Daddy’s Restaurant, which has quickly become famous for their unique pizza offerings. This out of the ordinary dining location offers some really interesting topping combinations, which may sound odd at first, but they certainly taste great. In between meals we needed something to work off the calories. Main Amana is a great place for walking. The landscape is fairly level, and sidewalks are numerous and wide. The town is small enough to be covered in a few minutes, but our walks kept getting broken up by all of the great shops. Quality and craftsmanship go hand in hand at the Amana Colonies. In every shop we found a variety of beautiful goods to purchase. This is another reason we love traveling by car, as it allows for ample room to haul home our new found treasures. The main drag through town is lined with the brown, unpainted buildings that are the trademark of the colonies. As we popped into each, we found boutiques offering unique articles of clothing and jewelry. At Midwest Leather, a nearby leather goods shop, we found everything from jackets to moccasins. Just a couple doors down is an amazing toy store named Little Red Wagon, which is filled to the rafters with gift ideas for the grandkids. Next to this is the Christmas Room, which as it name refers, is all about our favorite winter holiday. Here you can find just about any kind of ornament your heart desires, as well as the tree to hang them on. Farther east we came upon some of the hand crafted pieces that are designed to become family treasures. At the Amana Furniture & Clock Shop the place is packed with pieces built to be handed down to the next generation. The meticulous work is evident in every piece they create, and it made me wish we would have brought a trailer along, as well. 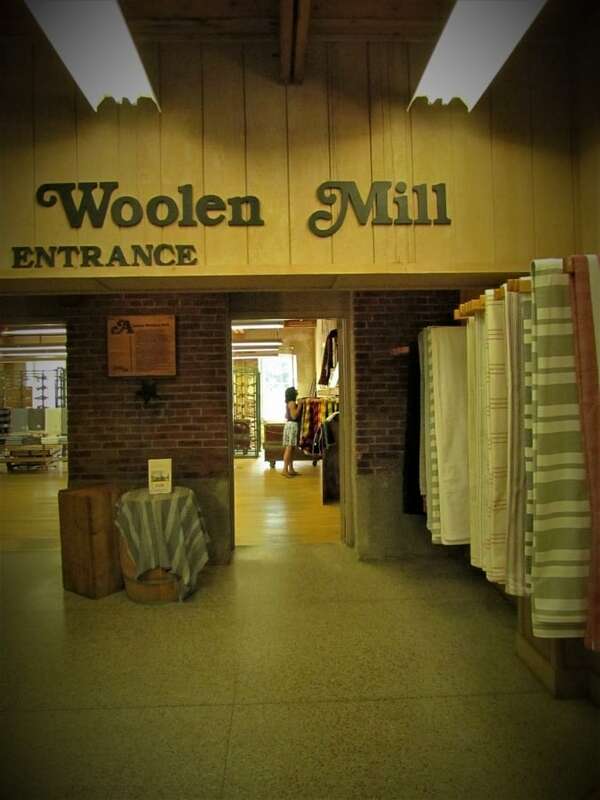 Just a little farther down the path we came to the Amana Woolen Mill, where visitors can see the machinery used to create their beautiful blankets. This is the oldest business in the Amana Colonies, and has operated since 1857. Clearly they have developed a winning recipe over that long of time. After a day filled with shopping and eating, it was time to find some other distractions. There are a few trails around the colonies that offer a chance to commune with nature. At the Amana Colonies Visitors Center we were able to get a couple of bikes to help take in some sights. These came in handy for a ride along Lily Pond, which is especially nice in the evening. Main Amana has a nice collection of wineries to visit, and each have their own distinct styles. (Read more about the wineries here>) It is quite easy to hit all of them in one day, if you wish. Of course, if you are there for the weekend you might as well spread it out. During our stay we were fortunate enough to have the chance to catch a show at the Old Creamery Theater. (You can read more about the theater here>) It was interesting to find this place sitting out away from the main town. The entertainment was very good, and we felt quite welcome. It was certainly worth the visit. The lodging options in Amana focus primarily on Bed & Breakfast style accommodations. There is one motel in the main town, as well. For our visit, we were fortunate enough to be hosted by Buh Schloss, which was one of the newer lodging choices. (You can read more about them here>) This charming home sits just off the main street, and offers a quiet place to rest after a day of exploring. This lodging option is the only AirB&B in the town, to our knowledge. Our visits to most cities usually have us moving at a fairly quick pace. We do this to be able to feature as many great options as possible, so that our readers can build an itinerary with the choices that best fit their favorite types of establishments. In the Amana Colonies the pace was slower on purpose. This type of town is meant to be savored, and a thorough exploration requires immersing in the local culture. The people of Amana are so kind, and friendly, that this is easy to do. Although we only spent a couple of days with them, we felt as though we were able to get a better understanding of the lifestyle that helped build this wonderful community. 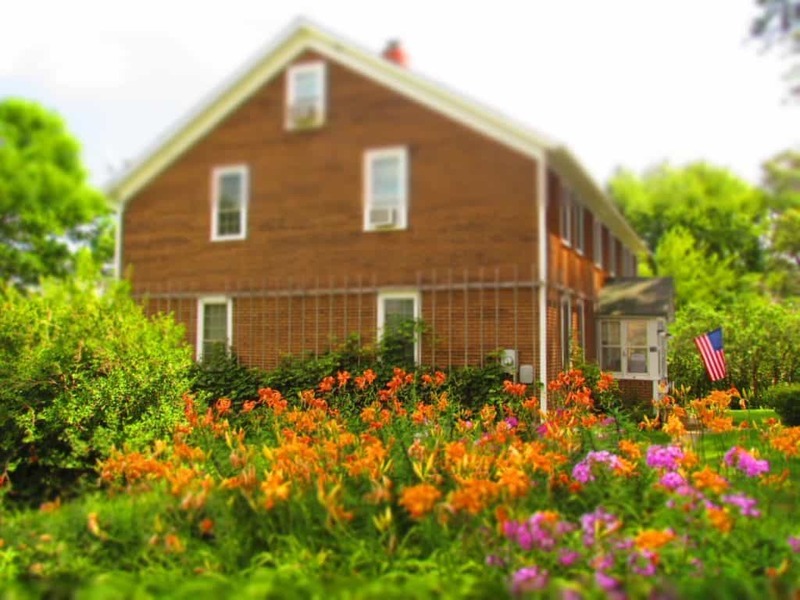 We hope you will take the time to visit the Amana Colonies, and sample their unique brand of hospitality. We are betting you will be impressed with the exceptional quality that is apparent in every thing they do. So what looks like the first thing you would want to try when you get to Amana? *We want to thank the Amana Colonies for hosting our visit. Rest assured that the opinions are all our own. The Amana Colonies aren’t Amish, nor do they use “Amish Buggies”. The Amana Comonies embraces technology, not forbade it. That is true, but we noticed some in the surrounding region. I’l never trust one of your reports again. You obviously didn’t do your homework. At the start you referred to the people as Amish. These people aren’t members of any of the Amish sects. They are completely different, in terms of life style, religion, etc. Hal, I’m sorry you misunderstood what I meant. I never said they were Amish, I merely mentioned that there were Amish buggies in the area, which suggested to us that it was a slower lifestyle we had arrived in. 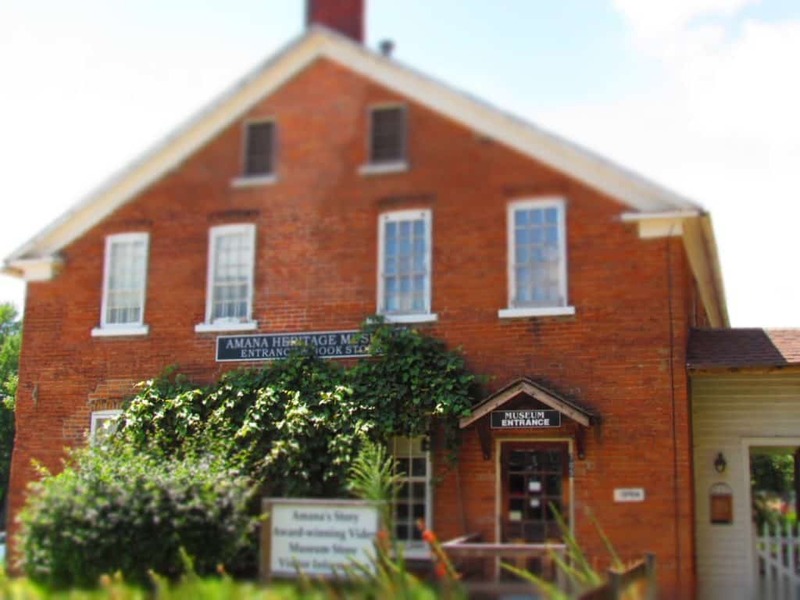 Our visit to the Amana Historical Museum gave us a basic understanding of their religious persuasion and the reason they had relocated to Iowa.